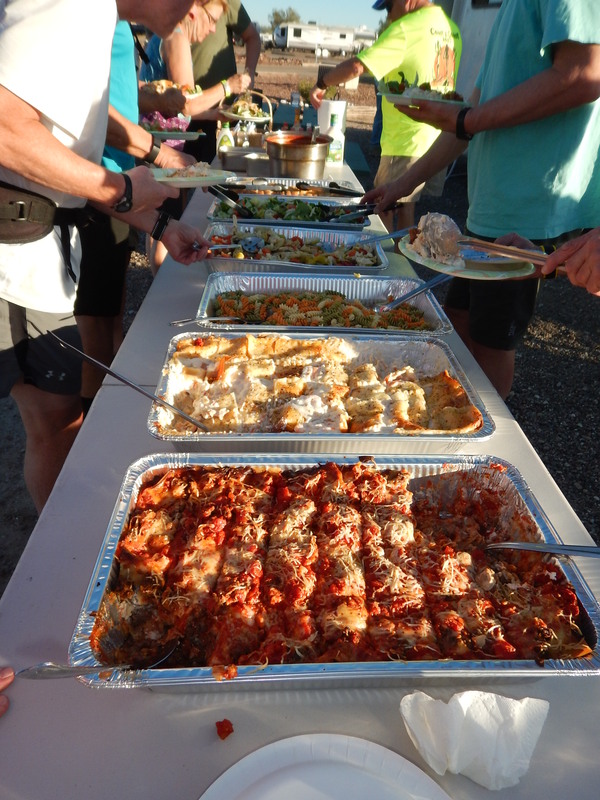 Our overnight at the KOA in Gila Bend featured an Italian feast from chef Anne. 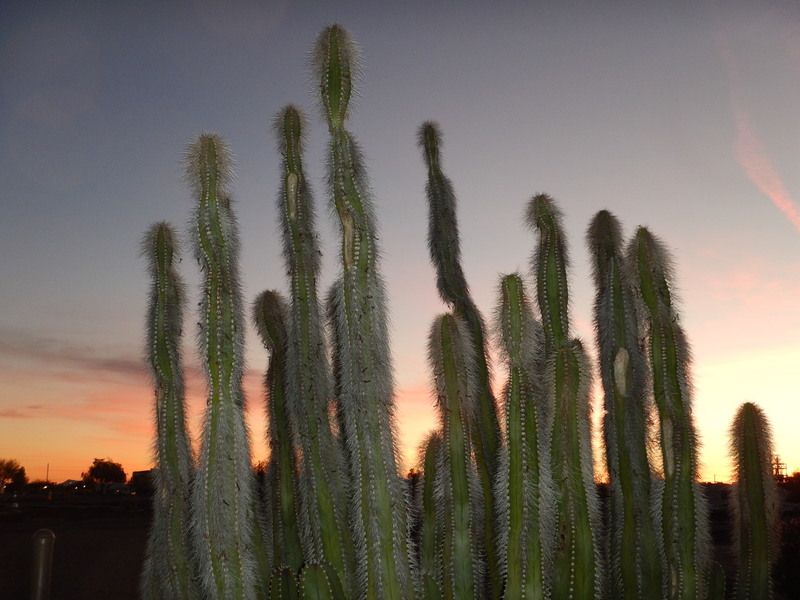 Check out this sunset through the cactus. 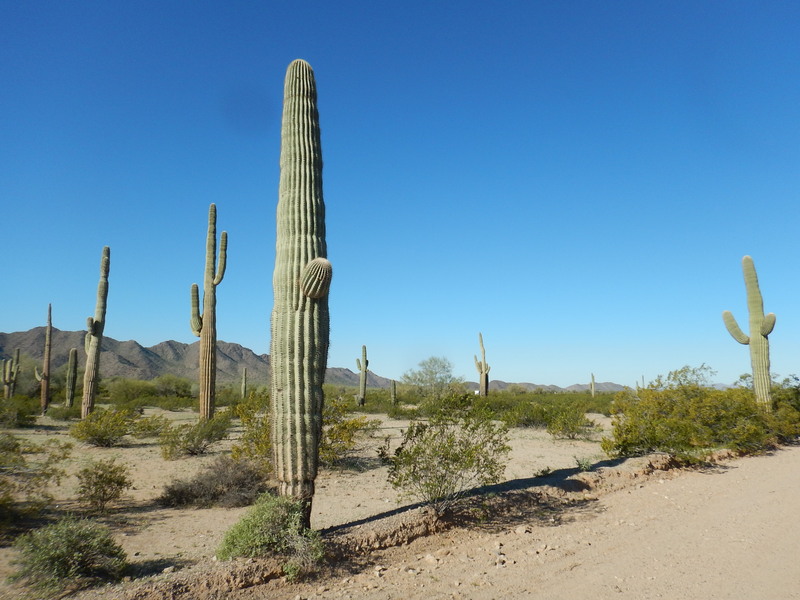 According to last night’s talk from Professor Steve, who follows this blog, you know you are in the Sonoran when you see the saguaro cactus, our “star of the day”. 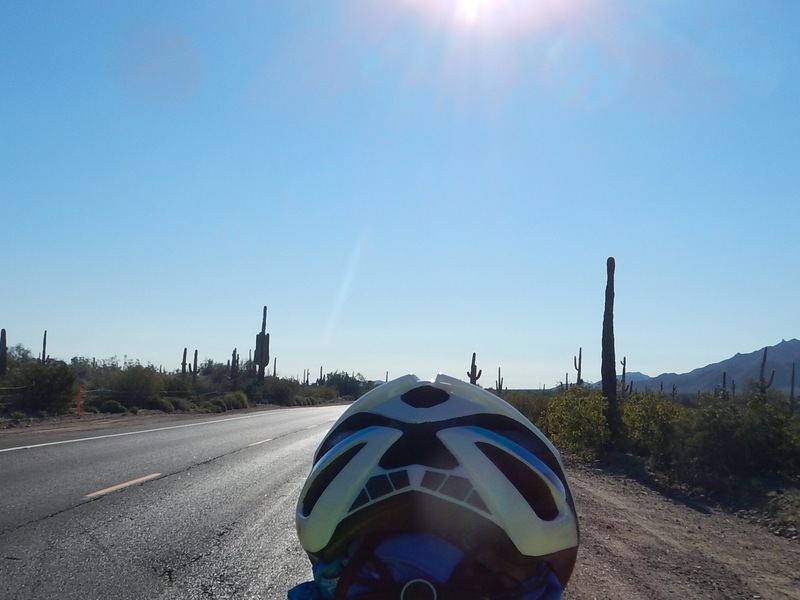 As roll down AZ-238, saguaro are everywhere. I take countless pictures and it’s very difficult to choose which photos will make the blog! 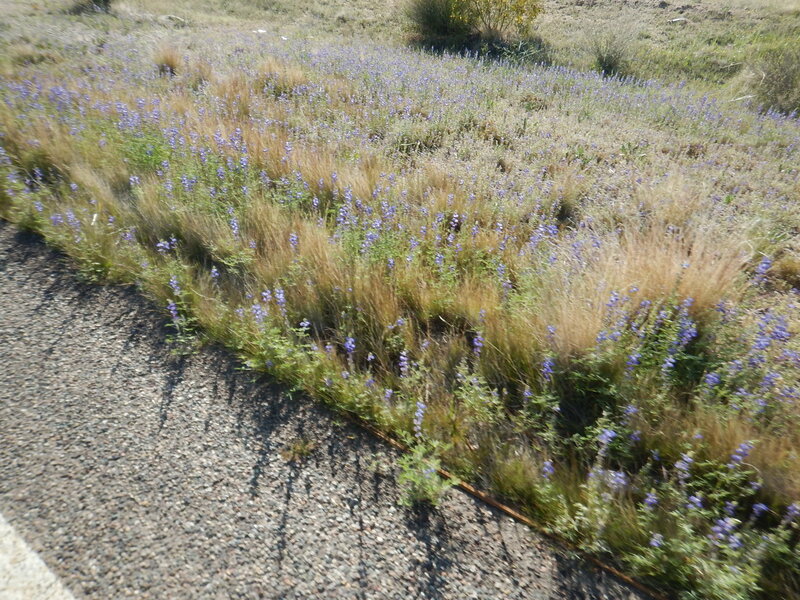 The desert is in bloom and today we are treated to some purple wildflowers as well. It’s a long hot day with several fun stops along the way. 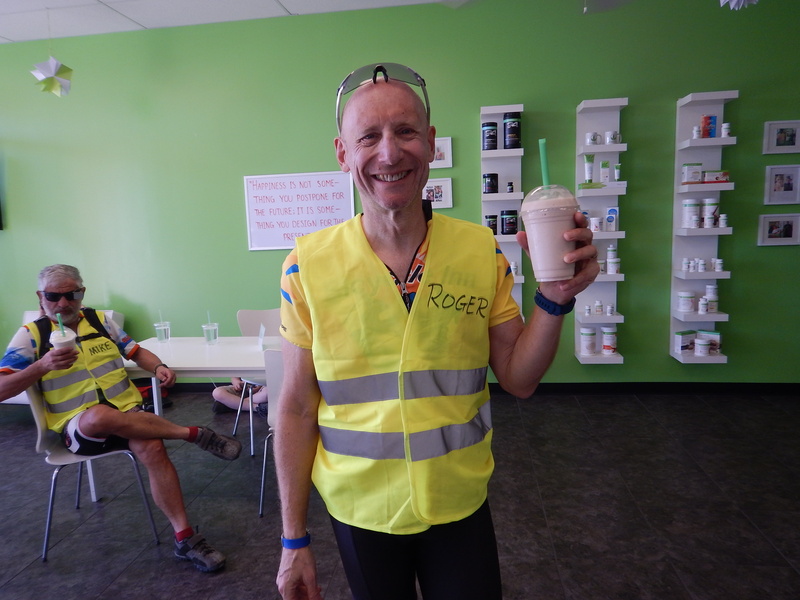 At 42 miles we stop to refuel and recharge at the Copa Craze Smoothie Shop. They are expecting us and are extremely accommodating when Roger wants to rewrite the menu. He wants a Black Forest without the chocolate base, so they make a white chocolate forest smoothie. 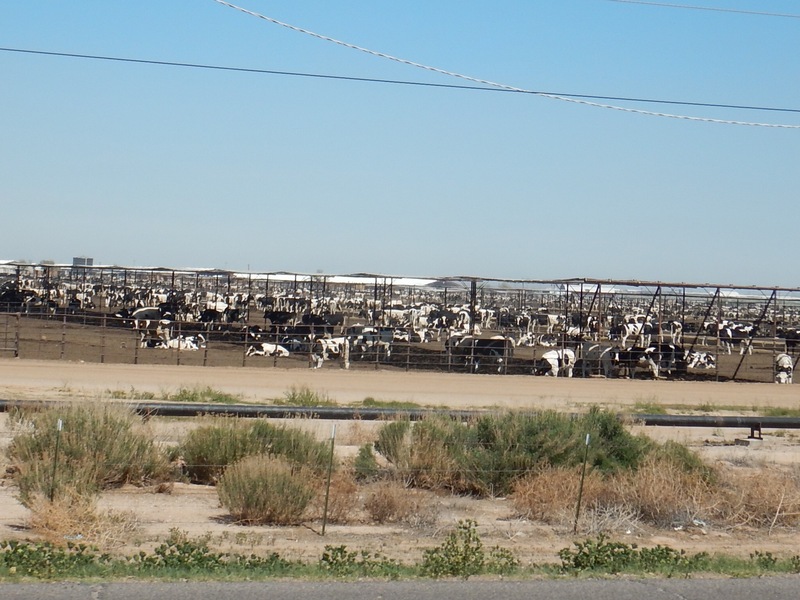 This area of Arizona is home to tens of thousands of cows. We’ve seen milk tankers and cream cheese factories and lots of lots of cows! 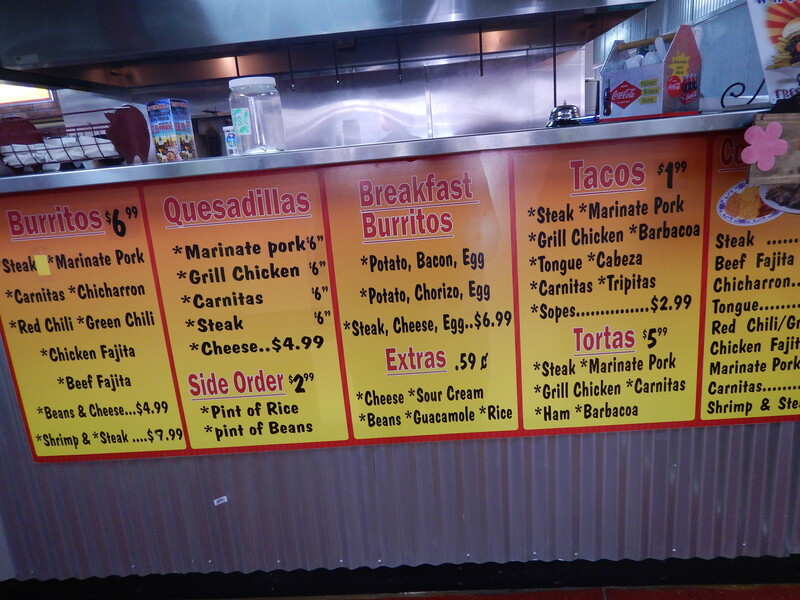 We are heading to the Stanfield Ranch Market for lunch where an unusual assortment of choices awaits us. 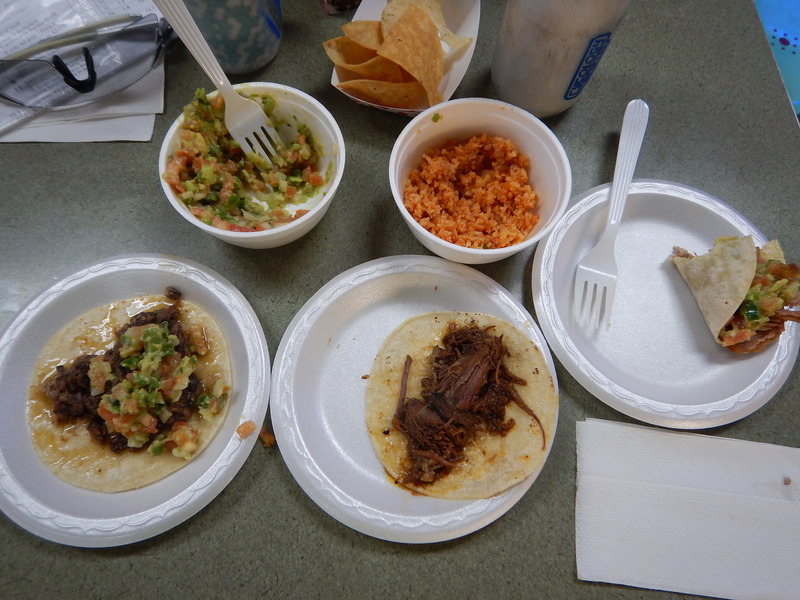 I choose the tongue taco and Roger goes with the carnitas and because they accidentally deliver shredded beef, we get to try that too! Tomorrow: Eight straight…will it be great? Food, flowers, Saguaro cactus and smoothies, too. Lovely pics and happy dreams to you both. You’re becoming like a distant ship’s smoke on the horizon. Have fun! I remember that road was very busy recycle trucks, trash trucks no shoulder. The desert 🌵 was great. I also think an over land pioneer trail went through. Great blog I’d love to do it again. I’ve started reading your blog because my dear friend Audra is one of your tribe of 25. I love your write ups! Tomorrow (I think) you camp at Catalina State Park which I’ve hiked in many times. I grew up in Tucson and my in laws live close to Tombstone which I think is the next night? I just showed Audra your comment! She thought it was pretty awesome! Yes. You are correct. I will tell Audra you are following! I check out you post everyday. Looks like a very exciting trip! We have enjoyed every entry. Wow, what fun to read. I say that sitting in a comfortable chair and a ham sandwich to eat. Tongue…maybe later. Thanks so much for all your posts. I look forward daily to reading them. You are awesome. Kevin has given up bike riding in his scramble to get the boat completed on time. Things are coming together. The Germans came to town and left with 2 of our spare cars which are currently on a container ship bound for Frankfurt eventually. Hugs from us. Keep up the incredible job. You are inspiring to us old guys.